A summarized view (notes) of the Stateless EJB pooling and life-cycle. Useful for newbies . . . . .
EJB instances are stored in a location known as the EJB Pool – this is nothing but an in-memory cache. Stateless EJBs are generally instantiated on-demand i.e. as and when the client invokes a method on the bean. However, most application servers also provide a facility wherein they can be configured so that the EJB pool can be populated at start up with certain number of instances e.g. in Weblogic, this can be configured within the weblogic-ejb-jar.xml by stating the exact number in the initial-beans-in-free-pool element. 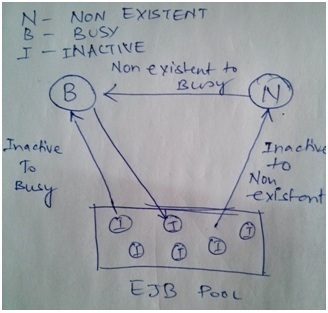 BUSY – An EJB instance is summoned in order to service a client request, and as a result it goes into a BUSY state. What happens when a client invokes a method on a Stateless bean? Scenario 1: A fresh instance of the bean is instantiated by the container. This entry was posted in Java, Java EE and tagged ejb, enterprise java beans, SLSB, stateless ejb. Bookmark the permalink. Pingback: EJB 3.x : Lifecycle and Concurrency models (part 1) | Object Oriented . .